oatmeal lace design: clutches in action! So fun opening my email today! One of the brides I worked with to design her bridesmaid clutches sent me a few photos of them in action from her wedding day this past weekend. I love it!!! This is actually a great segue for me to announce that I will be starting a 'real wedding' feature on the blog. 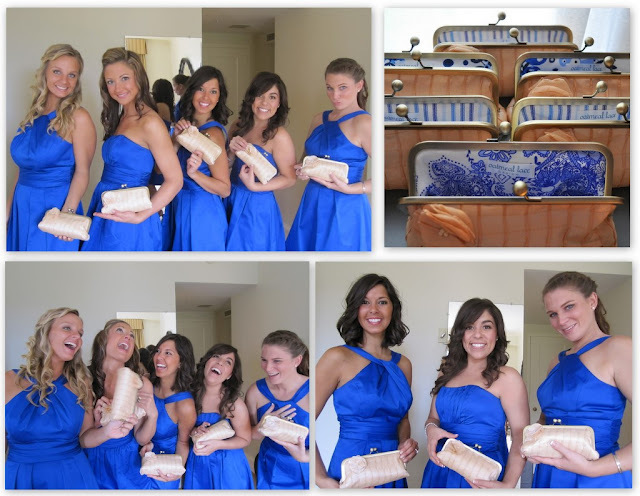 Some of the girls that have bought clutches from my shop have been kind enough to send me some thoughts and photos from their big day to share with you all. Yay! Next week I'm excited to feature Sara's real wedding. She was the first recipient of an Oatmeal Lace Design bag. I would post it over the weekend for you lovely readers, but I'll be camping and enjoying live music at Blackwater. So excited!!!! !